What a grievous blow to the classical music world was the untimely death of oboist Janet Craxton (1929-1981). 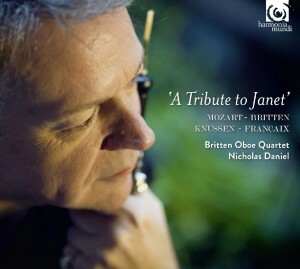 Her pupil, Nicholas Daniel, has devised and annotated this intoxicating programme in her memory which includes two substantial offerings inspired by her sublime artistry: Oliver Knussen’s masterly 1977 Cantata for oboe and string trio is as absorbing as it is personable, while Jean Françaix’s captivatingly inventive Cor Anglais Quartet from 1970 radiates a playful bonhomie guaranteed to lift the spirits. Written for Leon Goossens in 1932, the teenage Benjamin Britten’s remarkable Phantasy for oboe and string trio is a single-movement canvas of precocious brilliance, blistering cogency and intrepid personality. Mozart’s much-loved F major Oboe Quartet forms a delightful curtain-raiser, and we also get Daniel’s own stylish completion of the same composer’s Adagio for English Horn, K580a. I’m happy to report that performances throughout are simply beyond reproach in their keenly communicative instinct, deft aplomb and infectious dedication. Throw in top-notch production-values, and you have an absolute winner of a release.